Since I have mid-term exams next week I need to spend a lot of time on elaborate cooking experiments instead of studying. In Sweden I often make pasta (spaghetti or macaroni) with some tasy sauce. 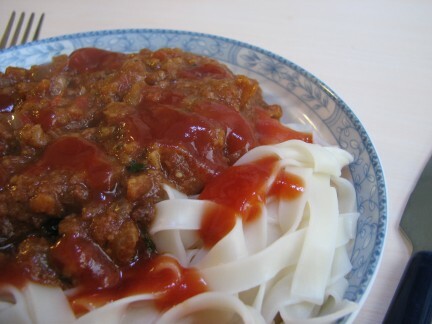 Yesterday I accidentally made something resembling pasta sauce when I used a kind of tofu that disintegrated into small pieces much like the soy granulate I use in Sweden (which in turn imitates ground meat). Therefore, today I set out to make pasta! Making the pasta sauce was simple enough, I used onion, garlic, tomato, disintegrating tofu, ketchup, pepper, bouillon and parsley. However, my local store doesn’t have any kind of pasta, so I ended up buying a type of noodles. After all, the ingredients and shape are the same… Actually, the Chinese really like to claim all kinds of inventions as Chinese, and pasta is no exception. Allegedly, Marco Polo saw noodles in China and brought back the concept to Italy. As of recently, however, we can all consult Wikipedia to learn that this is not true (if we understand English anyway). Nevertheless, using noodles as pasta kind of works. This entry was posted in Nonsense and tagged China, Food, Pasta. Bookmark the permalink. I haven’t tried pasta like this but I believe it worked well.